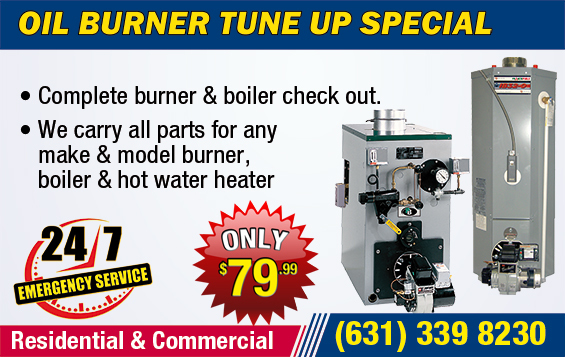 Is your oil burner or boiler ready for its annual checkup? Was it forced to work overtime during all those winter storms? Then don’t wait until it is broken to have it serviced. A regularly maintenance will help make your heating system work properly and last much longer. Tune-ups will also save you money on fuel costs. But if your heating system is already far too gone, and if it is costing you too much in upkeep and fuel already, maybe it’s time for a replacement. Whatever the case may be, our company aims to give you the quickest, safest, and most cost-effective heating possible. Whether your oil burner is water, steam, or forced air, and whether your system is old or new, our staff is ready to meet your needs. You can trust our experienced professionals to keep the heat on in your home. Our goal is to guarantee that your heating system works more efficiently than before so that you don’t have to worry about it. Our technicians are trained to safely maintain, repair, or install your oil burner or boiler so that your home is heated evenly. Regular maintenances of your oil burner can help eliminate much larger problems that might arise later on. To keep your heater working as efficiently as possible, it should be periodically cleaned, tightened, and lubricated. Don’t worry about your busy schedule. Our capable staff arrives on time and works swiftly so that we can finish the job as quickly as possible. If a new boiler fits your needs, there are amazing advantages to look forward to. Technological advancements in home heating systems have made boilers more durable and affordable. More importantly, your new boiler will be much smaller than those old clunky ones that take up entire rooms. They are also much, much quieter and have improved heating controls. Here’s a tip: the next time your oil burner is on, check the smoke coming out of your chimney. If the smoke is black, then your oil burner is not burning the oil properly, which means oil is being wasted. If your oil burner is doing this, you should call a professional technician to make the proper adjustments so all that expensive oil stops going down the drain. One of the reasons we do what we do is to keep you safe. Remember, oil furnaces produce carbon monoxide, which is a highly toxic and odorless gas. When your oil burner is working properly, the gas is safely released through a chimney. However, if the burner has been improperly tampered with, or if it gets clogged with soot or other debris, carbon monoxide can escape in the wrong places. Don’t let this happen to you! Stay safe. Do not tamper with your oil burner unless a professional has trained you. This will ensure your safety, your family’s safety, and your home’s safety. So call the leading oil burner providers in the business. We’ll keep the heat on.